A celebrated botanist, who had won world fame as the discoverer of “wild wheat,” Aaron Aaronsohn (1876–1919) created the first Jewish Agricultural Experiment Station in Palestine – then under Turkish rule – in 1910. His venture was supported and funded from the u.s. by a group which included Julius Rosenwald, Justices Louis D. Brandeis and Felix Frankfurter (both later on the u.s. Supreme Court), Judah L. Magnes (later President of the Hebrew University), and Henrietta Szold, the founder of Hadassah. In World War I, reacting against the oppressive Turkish regime, Aaronsohn founded a Jewish spy organization, nili, to help the British in the forthcoming battle for Palestine. Here is told the story of Aaronsohn, who is revealed as a master of strategy, and his sister Sarah, whose self-sacrificing devotion to the cause shows her to be a great historic personality in her own right. Historian Shmuel Katz here rectifies the absence of a comprehensive biography of Aaronsohn and the nili spy ring. Meticulously researched British War Office intelligence documents and the letters and field reports of nili’s central figures illustrate the crucial contribution made by nili to the British conquest of Palestine. 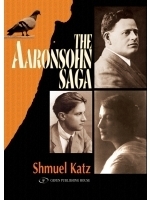 Powerfully written, with deep sensitivity to the emotional lives of the people portrayed, The Aaronsohn Saga is both solid history and a marvelous read. …Katz’s language is fluent and engaging, [reading] more like a novel than a work of history. He paints colourful portraits of all the main fi gures in the epoch and in doing so he also provides a fine picture of the life and times of the Yishuv and its relations with the outside world.